A peaceful and picturesque retreat awaits you at the West Wing on Blanche. 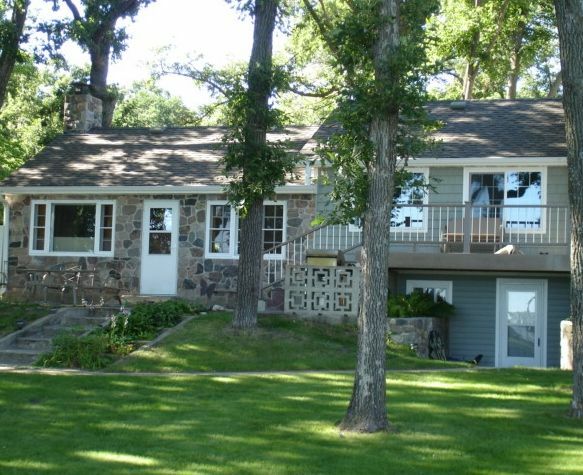 We are on the north shore and enjoy southern exposure overlooking the pristine waters of Lake Blanche. Across these waters you will find undeveloped shorelines and secluded sandy beaches in the wilderness environment bordering Glendalough State Park. This peaceful shoreline is located on some of the most remote parts of the park. It's a wonderful, inspiring place to beachcomb, kayak or just kick back at the water’s edge. You can relax, watch eagles fly overhead, see fish jumping, catch a glimpse of a deer coming down for a cool drink, enjoy the sweet smell of honeysuckle and listen to loons sing out to each other as the sunset colors fill the sky. The West Wing on Blanche is the perfect place to slow life’s pace while you reconnect with yourself, loved ones or enjoy a rejuvenating couple’s get away. The West Wing on Blanche is committed to providing a wholesome, mellow environment that leaves guests with a memorable experience. The 'West Wing' is on the west side of a large lakeside retreat which spans three lake lots and is closed off from the other side; much like a beautiful twin-home at the lake. The other side is not available for rent which further enhances your experience and sense of privacy during your stay. The West Wing does not lend itself to a resort-type environment with rental cabins and constant turnover of strangers all around. Crowds of visitors, loud parties or other disruptive activities that interfere with the tranquil experience the West Wing on Blanche was created for are not allowed. These high standards, maximum of six guests (four of which may be adults-renters/visitors combined), the rustic ambiance of our accommodations and all the beauty the West Wing offers lends itself to an elite level vacation experience at a very affordable price. Our lake country retreat overlooks the lake and has been newly renovated while holding on to it's rustic charm of bygone years. The West Wing has a fully equipped kitchen with new appliances, furnishings and plenty of modern amenities to enhance your stay. The West Wing is a rustic setting that has maintained the lake cabin feel with style and modern ameneties. We have a large open floor plan for the living area, dining and kitchen. The great room area also has two very comortable fold-out futons. Step up into the sunroom overlooking the lake. From there you enter the master suite which is finished off in natural colors, wood, and rustic decor. We have a maximum limit of 6 guests (four of which may be adults-renters/visitors combined) at the West Wing at any given time. Though some resorts have higher limits, often with less square footage, we wish to provide an elite style stay at an affordable price for people that wish to avoid the crowds and relax in style. It is for this reason that we provide a mellow place free of crowds, loud parties and groups of non-guests who come and go. So kick back and enjoy your stay! You'll instantly feel relaxed at the West Wing in our clean, comfortable lake home setting. We provide bath towels, sheets, blankets, pillows, utensils, dishes, pots and pans — all the amenities you need for a relaxing retreat. •Large bedroom 2 has many windows, new furniture and queen bed. The West Wing on Blanche offers the perfect base from which to explore the great outdoors. Let the birdsong wash away all the stresses of daily life. Or for those wanting to stay close to home, just hang out at the West Wing's large lake side yard for some yard games, picnic or play along the 140 feet of private lake shore. The bathroom has been entirely renovated to include beautifully tiled flooring and walls, new shower, toilet, sink vanity and all the rest. The feel reflects nature. Located on the north shore, warm southern exposure on 140 feet of pristine lake shore with clear water and sandy bottom. Open view of lake and undeveloped, remote shoreline of Glendalough State Park. Central air to master bed, bath area and sunroom, which also cools the great room area. Bedroom 2 has separate A/C. Ambiance only - no fires for safety and avoidance of smoke for our guests with allergies. Great room with black-out curtains for guests sleeping on futons. The kitchen is open for easy cooking. Recently renovated to include new counter tops, sink, flooring, backsplash, wine rack, lighting, and more. It adds to the rustic feel while being modern. 14' Lund boat, 15hp motor, @ dock side rents for $45/day. Great for fishing (anchor, carpeted flat floor, pedestal seat, one tank included...)or just for exploring. Minimum rental-3 day. Patio with table/umbrella and chairs to seat six. Lake Blanche is unlike any other lake in the heart of lakes country. Many of the surrounding lakes are nice but Lake Blanche is very special in many ways. We are the first lake down stream from Glendalough State Park. Our water comes from the waters that have been protected in the park for many years. Lake Blanche also is very undeveloped as most of the south shore is remote park lands and an enchanting place to beach comb and soak up the sun. The area was also home to Native Americans and remains home to many treasures from the past (you might find an arrowhead when you're beach-combing). The wildlife, history (American presidents have vacationed in the park), and beauty that surrounds Lake Blanche is beyond words. Our pristine waters, rich history, natural environment, sandy shorelines, lake bottom, and comfort of the West Wing will undoubtedly make you feel 'presidential' in a laid back sort of way! This was our family's third consecutive year staying at the West Wing. Tim and Kathy (and Jet!) are gracious hosts. Blanche is quiet and beautiful. And the house is wonderful. A great place to make memories. We had an absolutely amazing time and made a lot of great memories with our kids. The cabin was in perfect condition and Tim was a great host. He really went the extra mile to make sure we were enjoying ourselves and had a great stay. Lake Blanche was beautiful and we really loved the clear water and shallow areas where we could dock the boat and let the kids play. We hope to be back again next year! The owner Tim has his rental accommodations down to a fine art. Everything is excellent. I highly recommend this property as a place to enjoy the "Minnesota Lake Experience". We had an amazing time at the West Wing! Tim and Kathy were amazing and the lake is just perfect. It has a clear sandy bottom and the otter life raft and kayaks were huge hits with our kids! Tim took us on an amazing pontoon ride around the lake and the kids thought that was the best part! The cabin itself is beautiful and it has every comfort of home! We absolutely loved the West Wing. Thank you so much for the wonderful vacation. The beach, the cabin, the location.. all perfect. We would definitely come back! It was so nice to meet you both too, and Jet! Thanks again for everything! Had a fabulous time on Lake Blanche. This was a very cozy, relaxing place. Tim was a fabulous host who was always available if needed. Totally enjoyed the peaceful, beautiful lake and accommodations. Would highly recommend to anyone!!! A peaceful and picturesque retreat awaits you at this cabin named the West Wing on Blanche. We are on the north shore and enjoy southern exposure overlooking the pristine waters of Lake Blanche. Across these waters you will find undeveloped shorelines and secluded sandy beaches in the wilderness environment bordering Glendalough State Park. This peaceful shoreline is located on some of the most remote parts of the park. It's a wonderful, inspiring place to beachcomb, kayak or just kick back at the water’s edge. You can relax, watch eagles fly overhead, see fish jumping, catch a glimpse of a deer coming down for a cool drink, enjoy the sweet smell of honeysuckle and listen to loons sing out to each other as the sunset colors fill the sky. The West Wing on Blanche is the perfect place to slow life’s pace while you reconnect with yourself, loved ones or enjoy a rejuvenating couple’s get away. The West Wing on Blanche is committed to providing a wholesome, mellow environment that leaves guests with a memorable experience. The 'West Wing' is on the west side of a large lakeside retreat which spans three lake lots and is closed off from the other side; much like a beautiful twin-home at the lake. The other side is not available for rent which further enhances your experience and sense of privacy during your stay. The West Wing does not lend itself to a resort-type environment with rental cabins and constant turnover of strangers all around. Crowds of visitors, loud parties or other disruptive activities that interfere with the tranquil experience the West Wing on Blanche was created for are not allowed. These high standards, the rustic ambiance of our accommodations and all the beauty the West Wing offers lends itself to an elite level vacation experience at a very affordable price. Area Attractions for our guests include: Glendalough and Maplewood State Parks, Inspiration Peak, numerous historical attractions, several premium golf courses, Shady Oaks Riding Stables, boutiques, antique stores, art galleries, Red Horse Ranch rodeos and events, A Center for the Arts live musical/theatric performances, Prairie Wetlands Learning Center, mutiple summer community celebrations (Watermelon Days, Chief Wenonga Days, Flekkefest...), WeFest (top stars country music festival), 10,000 Lakes Festival, fishing tournaments, concerts in the park, turtle races, Phelps Mill, river tubing, sailboat lessons and rentals, jet ski rentals, country fairs, and countless other attractions.